Now comes even more evidence of the steady decline of American educational standards. 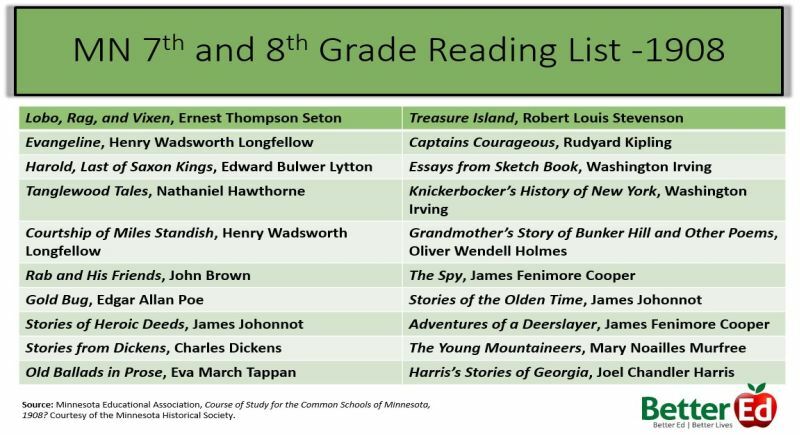 , discovered a 1908 curriculum manual in the Minnesota Historical Society archives that included detailed reading lists for various grade levels. What’s most interesting, however, is Ms. Holmquist’s very thoughtful analysis of the results. This observation probably rings true for many students and parents of students today. 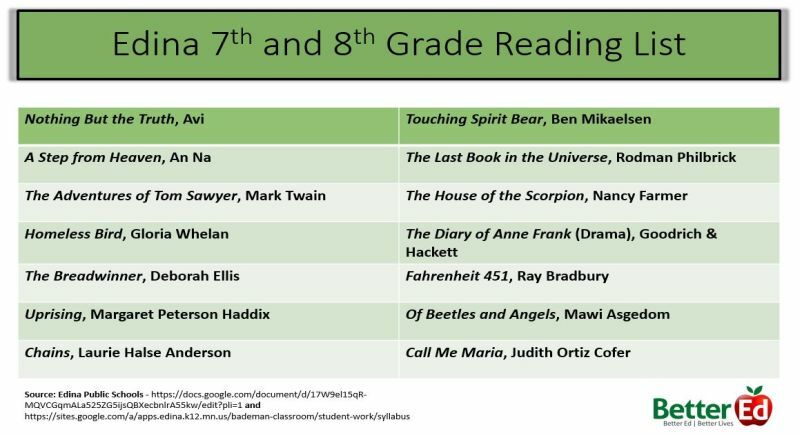 I keep a pretty good eye on regular high school and college reading lists. 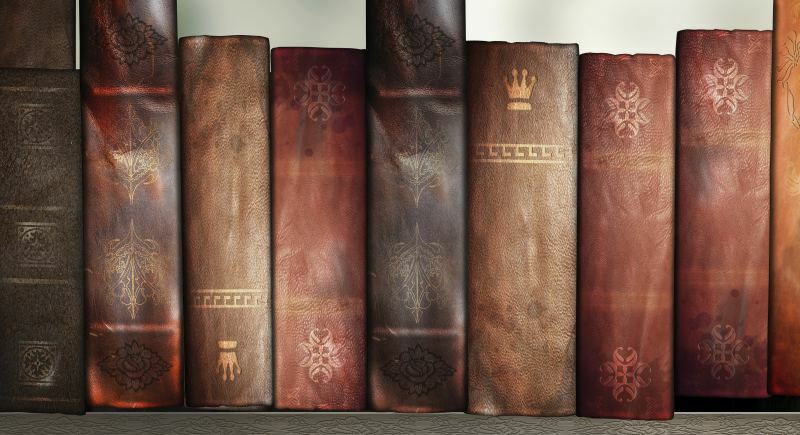 Although the occasional older “classic” makes an appearance now and again, I’ve been surprised to find how many teachers actually assign Harry Potter, the Twilight series, Stephen King, and The Hunger Games for classroom reading. And when I ask these teachers WHY those books are selected, the answer is always the same: Because those are the books that are popular today. There’s a greater likelihood that the student will want to do the reading and enjoy it as well. The result, of course, is that Shakespeare, Austen, Dickens, Dostoevsky, and Chaucer are relegated to the trash-heap. In school, students are reading the same books they would read at home (if they read at all), and thus never encounter the classics because they lack good help from a good teacher. Good teachers do not assign Twilight. To summarize the point, American students are not being taught about America. University students who major in social studies education are not being taught about America. I’ve talked to several of these types of students who want to teach American history at the middle school or high school level. So, these are our future teachers. And I always ask the same question: When was the American Revolution? Usually, I am met with dumb stares. Hardly any of them answer correctly: 1775-1783. This is because, for the most part, students who will eventually be teaching American history are not required to take a class on the American Founding. Again, these are our future teachers. Coach Jamison saw me in the hall and said he wanted to make sure I’m trying out for the track team!!!! Said my middle school gym teacher told him I was really good!!!! Then he said that with me on the Harrison High team we have a real shot at being county champs. Fantastic!!!!!! He wouldn’t say that unless he meant it. Have to ask folks about helping me get new shoes. Newspaper route won’t do it all. But Dad was so excited when I told him what Coach said that I’m sure he’ll help. This, I think, is Ms. Holmquist’s most important point: Our children are not being taught how to read, which really means they are not being taught how to think. Even classic works written in their native language–English–often appear to students like a second language. This is because they have never been challenged before. The first time I read Hamlet, for example, I filled my book’s margins with notes and scribbles, none of which had anything to do with actually thinking about the book. I was struggling even to keep up with Shakespeare’s plot. In other words, I had to teach myself how to read before I could even begin the much more difficult task of learning how to think. Our students are simply not learning these skills in school.